Over the last two decades, A-list star Mel Gibson has made an acting career out of playing larger-than-life, yet likable, heroes. He fought roadside marauders in the "Mad Max" series of films, maintained law and disorder in Los Angeles in the "Lethal Weapon" franchise, grappled with the kidnappers of his son in "Ransom", played a wild-eyed conspiracy theorist in "Conspiracy Theory", fought English tyranny in "Braveheart", got the money owed to him (and the girl) as the anti-hero of "Payback", outwitted a draconian chicken farm commandant in "Chicken Run", and battled the English yet again in "The Patriot". Now, Mel is back, only this time, he gets in touch with his 'feminine' side in "What Women Want", a light-hearted romantic-comedy that manages to be both entertaining and somewhat substantive at the same time. Gibson plays Nick Marshall, the type of man that women swoon for and every man aspires to, a so-called man's man. Not surprisingly, Nick also happens to be an incorrigible chauvinist and an unrepentant womanizer, the result of years of having everything 'his way', as well as spending his formative years growing up in Las Vegas, the son of a showgirl. Despite being a seemingly unstoppable hot-shot ad man at Chicago's Sloane/Curtis advertising agency, Nick ends up being passed up for promotion to the newly-vacated role of creative director. Instead, the job goes to a woman, Darcy Maguire (Helen Hunt, seen recently in "Pay It Forward"), who has made a career out of marketing to women, a niche that Nick's boss Dan Wannamaker (Alan Alda of "Flirting with Disaster") believes is essential to the company's survival. Of course, Nick is not happy about having the promotion stolen from him, so he decides to do whatever he can to undermine his new boss at every turn. One night, while racking his brain in a futile attempt to understand the female psyche, Nick has an accident involving his bathtub and an electrical appliance. Though Nick survives the electrical jolt, he develops the uncanny ability to hear what women are thinking. At first, he is horrified by his newfound 'gift', as he becomes inundated with the private thoughts of every woman around him, especially what they really think of him. However, a psychologist (Bette Midler of "Isn't She Great") helps Nick see the possibilities of this new ability, as he will be the first man in history who will truly understand what women want. Unfortunately, despite being better able to understand the female psyche, Nick is still the same self-serving person he always was, and shamelessly uses his mind-reading ability primarily for his own benefit. In addition to stealing ideas straight out of Darcy's head and scoring points with Dan by passing them off as his own, Nick finds it easier to seduce women he's interested in, by always being able to say the right thing at the right time, such as to an aspiring actress (Marisa Tomei of "The Watcher") who works at a local Starbucks. But to Nick's surprise, by constantly being privy to their innermost thoughts, he begins to feel compassion for the women around him and understand the errors of his ways. And to further complicate matters, Nick also begins to fall in love with the very woman he's been trying to undermine, Darcy. 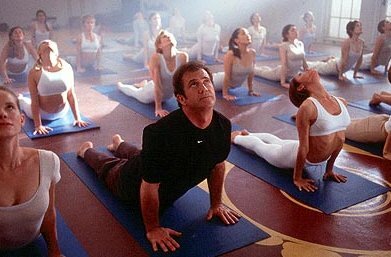 "What Women Want" works because of three things: Mel Gibson, Helen Hunt, and director Nancy Meyer's direction. Even when his character is being a poster-child for male chauvinism, Gibson manages to be affable, oozing personality and charm in every scene. When his character comes to grips with the ability to read women's minds, Gibson's sense of comic timing never misses a beat, hilariously over-reacting to every stray thought that comes his way. And as his character comes to understand the error in his anti-estrogen ways, Gibson once again steps up to the plate with a credible and heartwarming take on Nick's transformation. Hunt, who has been seen in a number of high-profile productions in the last few months, illustrates yet again that her Oscar-winning performance in "As Good As It Gets" was no fluke. As Darcy, she elevates the 'love interest' trappings of her character into a well-rounded and likable individual, which is aided by the potent chemistry she shares with Gibson. Director Nancy Meyers is no stranger to crafting light-hearted and entertaining fare, as her past credits include the two "Father of the Bride" films with Steve Martin, as well as the breezy 1998 "The Parent Trap" remake. Working with the Josh Goldsmith and Cathy Yuspa-penned script, Myers hits all the right notes in creating the appropriate contempo-fairy-tale atmosphere for the story, from the use of Frank Sinatra standards in the soundtrack to the 'valentine' shots of famous Windy City landmarks. The pacing and execution are similarly snappy, which keeps the humor humming along at a fairly quick clip. However, if there is anything to complain about "What Women Want", it would have to be the film's ending, which essentially drop kicks the audience after stringing them along with a fairly decent buildup. Instead of an emotionally satisfying resolution to Nick's dilemma (own up to the truth or betray the woman he loves), "What Women Want" ends up with a hastily-thrown-together denouement that is lacking in both credibility and poignancy. It's almost as though Meyers suddenly realized that she was down to her last reel of film, and had to cut it short. Ending aside, "What Women Want" still manages to succeed as a light-hearted and fun romantic-comedy, which should make it an easy pick for holiday moviegoers. 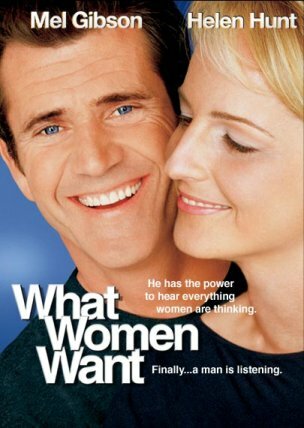 With the terrific pairing of Mel Gibson and Helen Hunt, backed by a script that is frequently funny, "What Women Want" is something that everyone, regardless of gender, will want to see.